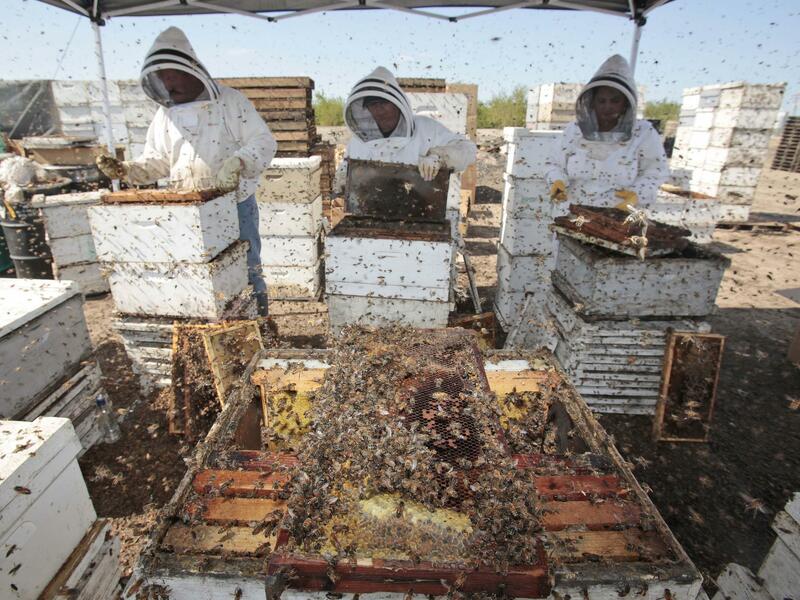 Workers clear honey from dead beehives at a bee farm east of Merced, Calif. But they may also be killing bees. Christian Krupke, a professor of entomology at Purdue University in Indiana, is among the scientists whose research has alarmed beekeepers. Last month, I caught up with Krupke at a DoubleTree Hotel in Bloomington, Ill., where he was giving a talk to several hundred farmers and the agricultural consultants who advise them about seeds, fertilizer and pesticides. The meeting was organized by GrowMark, a farm supply company. This was a skeptical audience, filled with people who make their livings using or selling pesticides. They listened quietly as Krupke laid out the reasons why neonicotinoids have fallen under suspicion. These pesticides are typically applied to seeds — mainly of corn, but also other crops — as a sticky coating before planting. When a seed sprouts and grows, the chemicals spread through the whole plant. So insects, such as aphids, that try to eat the plant also get a dose of poison. Krupke put up another slide: a picture of a huge machine that's used for planting corn. This equipment is apparently part of the answer. The farmers clapped politely when Krupke's talk was over. There weren't many questions. Krupke has given this talk to several farm groups. Most farmers just listen, he says, but some are moved to action. Each time, "it's probably at least two or three people who will say, 'I care enough about this problem that I will seek to not use these materials,' " he says. Some environmentalists believe that this shouldn't be left up to farmers to decide. They say the Environmental Protection Agency needs to step in. Last week, a coalition of environmental groups and beekeepers sued the EPA, demanding that the courts force the agency to revoke its earlier approval of two of the most prominent neonicotinoids — clothianidin and thiamethoxam. "The EPA should immediately take these two neonicotinoid pesticides off the market," says Paul Towers, from the Pesticide Action Network. Towers says that the problem with these pesticides goes well beyond those cases where lots of bees died all at once — maybe because of toxic dust from corn planters. Neonics also show up in the pollen of corn, canola and sunflowers that grow from treated seed. Bees feed on that pollen. The amount of pesticide they get is so small that it won't kill the bees outright. But Towers says it may have other effects: "Disorientation; reduced ability to gather food; impaired memory and learning; and lack of ability to communicate with other bees." Towers says this low-level exposure to neonics, from millions of acres of seed-treated crops, may be weakening honeybee hives, killing them slowly. Bayer CropScience, the biggest seller of these pesticides, insists that most studies show that neonics are quite safe. David Fischer, the company's director of ecotoxicology, says that in the real world, one cannot observe these chemicals causing any widespread harm to bees. For instance, he says, "in Canada, virtually all the canola is grown from neonicotinoid-treated seed. And the health of bees in that area of Canada, the prairie provinces, is as good as anywhere else in Canada." Yet Bayer CropScience is reacting to reports of bee kills. The company is working on a new system for planting corn that replaces the powder in planting machinery with a waxy substitute. The company says just making that change can cut the amount of neonics released from corn planters by 50 percent. For critics of these pesticides, though, cutting releases in half isn't good enough. From NPR News, this is ALL THINGS CONSIDERED. I'm Audie Cornish. Environmentalists and beekeepers are calling on the government to ban some of the most popular insect-killing chemicals in the country. The pesticides are used to coat the seed of many agricultural crops. They protect crops from insect pests. But as NPR's Dan Charles reports, they may also be killing bees. DAN CHARLES, BYLINE: During the winter, when Midwestern fields lie frozen and quiet, farmers and their suppliers have a chance to catch up on the latest agricultural technology. On this day, they've packed a conference center in Bloomington, Illinois, and what they're learning is a little disturbing. Christian Krupke, a specialist on insects from Purdue University, is telling them about a dark side of some products that they use. CHRISTIAN KRUPKE: All right. So the big players here - you know these names - Cruiser and Poncho. CHARLES: Cruiser and Poncho are insecticides, two members of a family of insecticides called neonicotinoids, or neonics. They're applied to practically all the country's corn seed as a sticky coating before planting, also lots of other crops. When a seed sprouts and grows, the chemicals spread through the whole plant. So insects, like aphids, that try to eat the plant get poisoned. But Krupke tells the farmers their neonics might be killing more than aphids. He puts up a picture of a beehive surrounded by a carpet of dead honeybees. In Indiana and several other places, there have been isolated reports of bees dying like this with traces of neonics on them. But the mystery has been how could something that you bury in the soil with the seed end up in bees? KRUPKE: How are we getting this connection? CHARLES: OK. So here's part of the answer, Krupke says. He puts up another slide, a picture of a huge planting machine. These machines use air pressure to move seeds from storage bin to soil. Also, a soft powder - talc or graphite - keeps everything flowing smoothly. The air, along with some of the powder, blows out through a vent. We tested that planter exhaust, Krupke tells the farmers, and we found amazing levels of neonic pesticides: 700,000 times more than what it takes to kill a honeybee. That toxic dust can land on nearby flowers. Maybe that's how it gets on bees and kills them, because these die-offs all happened during corn-planting season. KRUPKE: All right. That's all I have for today. Thank you. CHARLES: The farmers clap politely when the talk is over. There aren't many questions. Krupke says most farmers just listen, but a few feel like doing something. KRUPKE: I've given talks like this several times, and it's probably at least two or three people that will say, you know, I care enough about this problem that I am going to seek to not use these materials. CHARLES: Some environmentalists are now saying this shouldn't be left up to farmers. The Environmental Protection Agency should step in. PAUL TOWERS: EPA should immediately take these two neonicotinoid pesticides off the market. CHARLES: Paul Towers is a spokesman for the Pesticide Action Network. The problem, he says, is not just those cases where a lot of bees died all at once, maybe because of toxic dust from corn planters. Neonics also show up in the pollen of corn, canola or sunflowers that grow from treated seed. Bees feed on that pollen. The amount of pesticide they get is so small it won't kill the bees outright, but it may have other effects. TOWERS: Disorientation, reduced ability to gather food, impaired memory and learning and a lack of ability to communicate with other bees. CHARLES: Towers says this low-level exposure to neonics from millions of acres of seed-treated crops may be weakening honeybee hives, killing them slowly. Last week, his group, along with others, sued the Environmental Protection Agency, trying to force the EPA to ban neonics. Bayer CropScience, the biggest seller of these pesticides, insists that most studies show that neonics are quite safe. David Fischer, the company's director of ecotoxicology, says, in the real world, you cannot see neonics causing widespread harm to bees. DAVID FISCHER: In Canada, all of the canola is grown from neoniconoid-treated seed or virtually all of it, and the health of the bees in that area of Canada, the prairie provinces, is as good as anywhere else in Canada. CHARLES: But Bayer CropScience is reacting to reports of bee kills. It's working on a new planting system, replacing the powder in planters with a waxy substitute. The company says making that change cuts the amount of neonics released from corn planters by 50 percent. For the critics of neonics, though, cutting releases just in half is not good enough. Dan Charles, NPR News. Transcript provided by NPR, Copyright NPR.